After a winter that felt never ending, summertime is right around the corner. That means sunny days, longer nights, backyard barbeques, and nights spent outside enjoying your patio. Obviously, if you plan to use your patio, you probably want to sit on clean furniture, so first and foremost, you should invest in high quality patio furniture covers. This kind of furniture will be more durable, resist fading, wear and tear, and show less dirt than cheaper, poor quality options. Along with that, you should spray your furniture with a non-toxic insect repellent such as OFF! To keep the bugs, dirt, and nasty germs away. Before you clean acrylic cushions, remove them from the frame. Use a sponge, gentle soap, and water to spot clean problem areas, then use clean water to rinse them, allowing them to dry before using them to prevent mildew. If mildew is what you’re tackling, create a solution made up of 2 cups of detergent, 1 cup of bleach, and 1 gallon of water, mix all ingredients, and then spray onto the cushions. Leave them for thirty minutes so the mixture can do its work. Use a sponge or rag to scrub, rinse with water, and let the cushions dry. If you need to store them, avoid wrapping them in plastic, which is not breathable and can cause mildew. Cloth furniture is machine washable and should be run on the gentle cycle (white items should be washed with bleach). Next, hang your cloth items outside so they can dry. During the winter months, cloth furniture should be kept indoors. 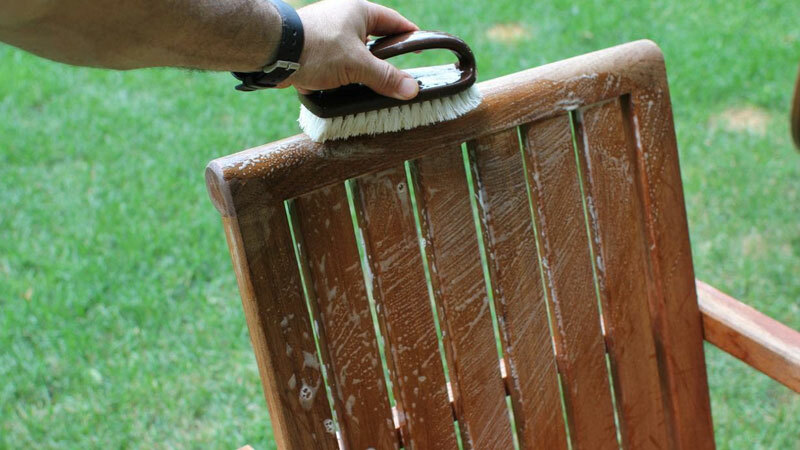 If an exterior grade varnish coats your wood furniture, you can clean it with just soap and water. When you’re through, make sure you completely rinse your furniture with water. Like cloth furniture, your wooden furniture (unless it’s teak or cedar) should also be kept indoors during the winter. Use a pressure washer or hose to tackle your wicker furniture. Take the cushions off, spraying spills and dirt. For extra dirty wicker, you should use gentle soap, cold water, and a sponge. Give the furniture time to completely dry. Next, coat the frame with a paste wax to maintain its water resistance and shine. Cushions and frames should be kept inside when they’re out of season or not in use. Water and a gentle soap solution will do the trick for steel, wrought iron, and aluminum frames. Most metal frames that are modern are also designed to be resistant to rust, but if your furniture isn’t, apply naval jelly or paste wax to prevent it from rusting or corroding. Keep your umbrella usable all summer long by oiling its joints and washing its cover. All that’s needed to wash the cover is a brush with soft bristles, cold water, and gentle soap. Wire frame umbrellas should have their joints sprayed with a lubricant, and wooden frame umbrellas should have paste wax applied to maintain shine. Whatever furniture you’re cleaning, always follow the instructions from the manufacturer. Those guidelines, in addition to the tips listed above, will keep your patio furniture sparkling and shining all summer long!